Malone University History Seminar, Massillon Public Library present "Friendly Neighbors: The Origins of Stark County Friends Communities"
Malone University will host "Friendly Neighbors: The Origins of Stark County Friends Communities: A Collaborative Exhibit by the Malone University History Senior Seminar and the Massillon Public Library" December 4-9 in the Malone University Art Gallery in the Johnson Center for Worship & Fine Arts. Thomas and Charity Roach, Quaker settlers who founded the community of Kendal (Massillon), promoted new farming ideas, and built a school for underprivileged children. Each student in the upper-level history seminar course was responsible for an element of the exhibit. Students in the class include Donald Brown, Chandler Craddock, Tanaja Davis, Sarah Dickes, Ben Evans, James Holmgren, Hannah Kirchenbauer of North Canton, Ashley Mason, Margaret Poorman, Leah Rauscher, and Jacob Shoup. The students spent the semester carefully studying the primary source of the Rotch-Wales Papers, which were found on the Historic Spring Hill Home in 2003 and is the largest collection of historic Quaker documents in Ohio, according to Massillon Library Archivist Barbara Whittman. The collection is available online at: http://massillonmemory.org/the-rotch-wales-papers. 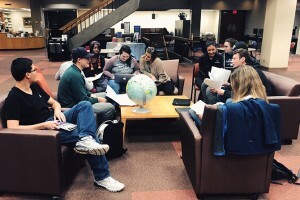 "It was fascinating to explore the lives of Thomas and Charity Rotch and how they brought Quakerism to this part of Ohio," said Rauscher, who is majoring in Integrated Social Studies. "It's so interesting to see the Quaker connections and the community they made in Kendal and Massillon. Without them, we might not have had as many Friends churches in the area. I'm looking forward to sharing this knowledge with my future students."